on the "Rock Across the Channel" one-day festival in Calais in 1961. 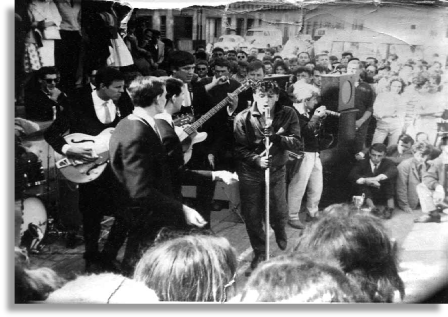 Gene Vincent has always had a place in my heart and in my mind." From the many gigs had with The Hi-Fi’s, I have listed some of them with the stories that made them memorable. Including other happenings. 1957 - Aged 13. A vivid memory I have at a rehearsal, involved an amplifier that Ian Duncombe had made, he was like that, very handy, he had to make his own guitar because he was a left hander, electric guitars were rare, expensive and getting hold of a lefty was unheard of back then. Anyhow the amp blew up and filled the room with thousands of waxy snow-like flakes and a bad smell-rehearsal cancelled! 1957 - The first gig I remember was at London University near Kings Cross station. Crammed onto a small stage Ian Duncombe accidently hit me on the forehead with his guitars machine heads, I had a very spotty face at the time and blood was all over the place, luckily a plaster sorted it. 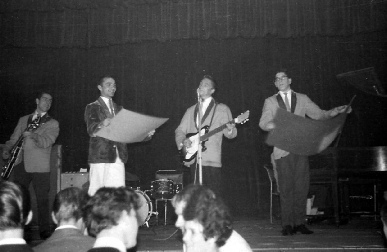 1957 - Remembering one of the early gigs at Roger Newell’s sisters school in Wallington, a young Jeff Beck gazed at us all night, he had started learning to play the guitar and was fascinated with the home made, left handed guitar of Ian Duncombe’s and the Cliff Gallup styled solos of Ian’s, Jeff we found out later, was also a Gene Vincent fan as he still is today. 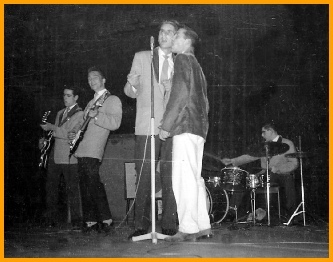 1957 - Ian and I used to get together a lot, in his front room learning Gene Vincent songs amongst others, Cliff Gallup ruled as far as we were concerned. We perfected a slow song, “Up a Lazy River” and persuaded singer Roger Newell to learn it also and then performed it at The Putney Ballroom (St Margaret’s Church Hall). Well that was a big mistake as the crowd started throwing money at us, they did not like it, but Ian saw it through to the end. When we finished he picked up all the monies and it paid for fish-n-chips on the way home, oh happy days! Hank played an Antoria guitar then, so I had to have one for myself. 1960 - Ed Waller, owner of The Park lane Ballroom, hired the MV Royal Daffodil for a cruise from Gravesend to Margate and back. He used the groups that played at the ballroom, giving Vern Rogers and The Hi-Fi’s top honour to play on the best part of the boat; it was great, what you might call a booze cruise! We used to look forward to playing in Barnet (we played there at least 26 occasions). The small hall had a great sound, probably because the pub was a few doors down the road. Every visit we would play bar billiards and cribbage, challenging the elder local regulars, as well as having a good drink between sets. 1961-March - Len Ford had his new guitar, a Futurama III stolen from the Park Lane ballroom. 1959 - 17th January - Cheam Public baths on the same bill with Cliff Richard and The Drifters. “Move It” was number 1 in the charts and we learnt to play it, also the B side “Apron Strings”. We performed this on stage and The Drifters were behind the drawn curtains setting up. They were not amused, as they turned up their amps and made a racket , to register their disgust that a support band should play one of their songs. Anyway it did not result in trouble and they actually remarked how good we did it. What a sound they made on stage, it was fabulous. We were amazed, because Jet Harris had a 4 foot square speaker cabinet to put the bass through, it purred. The following day Len Ford & Malcolm Wright set about making one for us, we put 4 x 18inch speakers in ours. It not only improved our sound, it also doubled up as seat rest in the back of the van and stopped all the other gear moving forwards when braking. This pic shows the 4 foot square bass cabinet. Foolishly we had started leaving the gear stashed in the cloakroom, as we used to perform Fridays, Saturdays, Sundays and Tuesdays. It made life a lot easier, but I will never forget that disbelief that someone would nick it and the sick feeling in my stomach. Luckily a guitar was borrowed from somewhere. The next day we had a gig in Maidstone, luckily I had some money saved and I borrowed the rest from Mum & Dad. 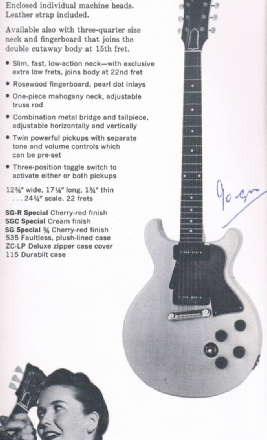 I became the proud owner of a Les Paul Gibson Junior with twin pick-ups in cherry red. Purchased for 90 guineas from Lew Davis’, in Charring Cross Road, in London’s west end. I only just made it to the gig and of course I forgot to get a new strap. I had to use a neck tie as a strap at the gig. 1961-October - Len Ford (lead guitar) and Alan Reynolds (bass) toured 4 TV stations backing Jackie Atom (aka Trevor Peacock songwriter/actor) and Jack Good (producer of Oh Boy TV show). One of these was “Thank Your Lucky Stars” introduced by Brian Mathew. The record being promoted was "Hot Hiss Of Steam" (is mentioned on Jack Good's Wikipedia page, without label details). The single was on Decca F 11387, issued 8th September 1961, as by Big Jim Sullivan Combo, with Jim on vocal as the A-side, "You Don't Know What You've Got (Until You Lose It)", and Jackie Atom on the B-side, "Hot Hiss Of Steam". I remember gaining some Chet Atkins licks from Jim as we jammed off stage, he also had some good stuff he’d picked up from Eddie Cochrane, it is a great memory for me, funny thing is I don’t remember getting paid, ce’st la vie. 1962-17th June - The Hi-Fi’s were booked to appear on the MV Royal Daffodil. This went from Gravesend to Calais in France. The Hi-Fi’s were mainly engaged to back Gene Vincent on the journey out, the boat would then collect Sounds Incorporated at Calais on return from a European tour, where-on they backed Gene Vincent on the return journey. Prior to this gig we had rehearsals with Gene, held at The Granada Cinema at the Kennington Oval. Other attendees for this were Don Arden, Barry Clayman and Ron King, Gene Vincent’s sole UK manager and agent etc. 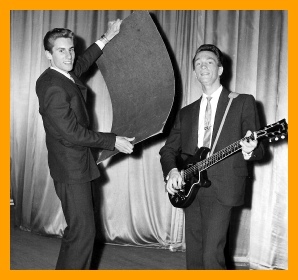 The time spent in 1957, learning those Cliff Gallop guitar solos with Ian Duncombe, certainly paid dividends. This to the band was a great honour and a never to be forgotten gig. This picture shows Gene with Sounds Incorporated’s lead guitarist John St-John performing on the return trip from Calais, the man sitting at the rear of the picture, with sunglasses on wearing a dark blue suit is Brian Bennett The Hi-Fi’s pianist, and headless behind him is Len Ford, oh well ce’st la vie. We cannot find any other pictures of the whole event. 1962-17th October - Vern Rogers & The Hi-Fi’s auditioned for the BBC for appearances on BBC TV, sadly we were not offered any gigs. Around the same period, auditions for Hughie Green’s Opportunity Knocks took place, this also resulted in rejection, a familiar situation most musicians have encountered. 1962/3-31st December/1st January - The Hi-Fi’s, with Vern Rogers made an appearance promoting the releases of their single “Be Everything To Anyone” on Oriole Records, on Five to Six Special, BBC TV show (I think that was the title) out of the Bristol studios. This took place over 2 days New Years Eve and New Years Day. It was a particularly bad winter, vivid is the memory of the journey from Croydon to Bristol, taking something like 6 hours using shovels and a lot of help with pushing up snowy hills, but we made it just, a case of the show must go on. Top of the bill for this show was The Bachelors. 1963-12th January - A prestige gig, on the Isle of Wight at the aptly named Ventnor Winter Gardens. Departure of the ferry from Southampton was delayed, as the sea had a thick layer of ice from the bad winter weather, which had to be broken up before the ferry could dock. This should have prepared us for the fact that hardly anybody turned up. We only got paid expenses and had to spend a night in a cold B&B in Ryde. 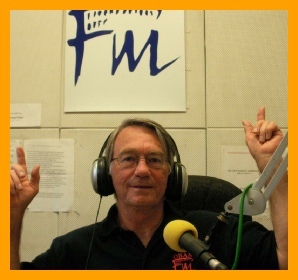 1963-27th April-18th May - The Hi-Fi’s the day before had parted company from they’re long time vocalist Vern Rogers. Due to the fact that he was semi-pro and we had gone professional ages ago he could not commit the time to the Robert Stigwood’s “1963 All Star Tour”. We had at the last minute been engaged to provide the backing for some of the artists on the bill. Initially the Innocents, (Mike Berry’s backing band) had been booked, but as they were backing all the headline acts, it proved too much for them. We had the pleasure of providing instrumental and vocal backing for; Billy Boyle; Grazina Frame; Bick Ford; Don Spencer; Duffy Power and also the other last minute act added to the tour, Frankie Valli & The Four Seasons. Near the end of the tour we all ended up being invited to a night club in West Derby, a great night I think, trouble was I got completely legless (in the back of the coach where I threw up), drinking a whole bottle of Johnnie Walker whisky with the Four Seasons, the main culprit being Bob Gaudio. 1963-27th September - An unforgettable night as far as Len Ford was concerned, as it must have been for the other lads. 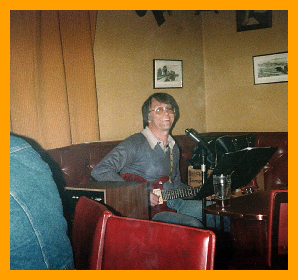 This was the 8th and last appearance at The Pigalle Club Restaurant, where we had previously backed Rolf Harris. The Hi-Fi’s covered Rolf’s “Tie me Kangaroo Down” and were masters at the art of wobble board playing, as you can see from these pictures. The one with Len Ford & Brian Bennett, are from a holiday at Butlins in Skegness, (we met Rory Storm & The Whispers, with Ringo Starr on drums). Len & Brian won the talent show heat and got a free return holiday for the finals, we did not win this. He subsequently spent 6 months in the Hermitage Cottage Hospital, Upper Norwood. 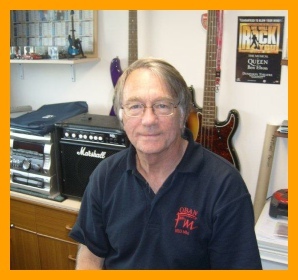 The Hi-Fi’s, Malcolm Wright and Brian Bennett visited to confirm the inevitable, that he could not return to the band. Where-on they told him that they had found a replacement lead guitarist; he went by the name of Duane Eddy. As luck would have it, his group The Rebels could not come to the UK, due to musician union exchange rules, and so Duane needed a backing band, The Hi-Fi’s got the gig. 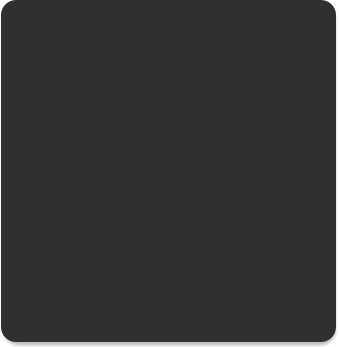 Liquorice Locking the Shadows & Marty Wilde's bass guitarist, also visited Len, as it turned out to try and convert him to become a Jehovah’s Witness, after he was informed that it was the wrong time and place, he was never seen again. It took a further 6 months convalescing at home before Len was declared fit and recommended not to follow the musicians lifestyle and so joined the everyday work place. 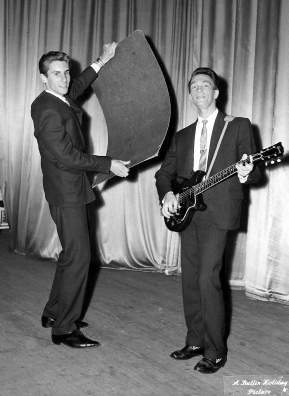 The Hi-Fi's regrouped and in early November 1963 were engaged to back Duane Eddy on the tour with Little Richard. So you could say that Duane Eddy replaced Len Ford as lead guitarist in The Hi-Fi's. Len Ford did return to a work environment, he took up a position as a receptionist/tester with Frank Watson BMC franchise garage in Thornton Heath in late 1964. The Hi-Fi’s continuing story is covered within the other member profiles and memories. 1963-7th June - The Hi-Fi’s appeared at The Floral Hall, Morcombe, supporting Freddie & The Dreamers. Well you may recall a detail from the Cliff Richard & The Drifters gig in 1958. We liked to perform a version of the headline acts hit, which turned out not to be a popular thing, as when we returned to our dressing room, our spare suits all had the pockets ripped off, we never did that again after that and of course they denied all knowledge of it. 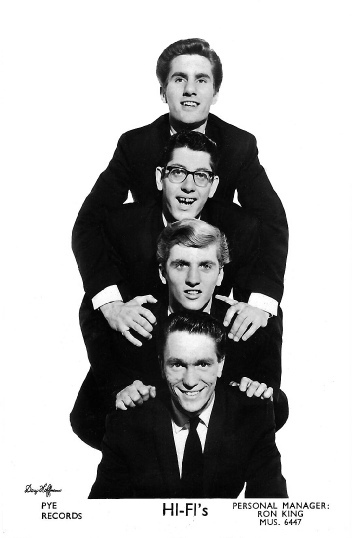 1963-5th to 14th July - Because of the Hi-Fi’s account of themselves on the “All Stars 63 Tour” John Leyton’s manager at that time, Robert Stigwood engaged them to accompany John Leyton on a 10 day tour in Sweden. This was a hard tour as it covered 21 venues, which involved 2 venues per night and a TV show in Stockholm. Most of the gigs, if not all were performed in the open air. Sweden had a large amount of parks with bandstands or auditorium type venues. This was possible due to the fact that the summer days are very long and it hardly gets dark. We started each show covering The Beatles songs, “Please, Please me” and “From Me To You”. This went down well with the crowds as I’m sure some of them thought we were The Beatles (if only). Below is part of an e-mail sent to Michel Leconte who took the photograph. I have some questions I would like to ask you about this picture below from June 12th 1961. I would be very pleased to hear from you if you can spare some of your time. 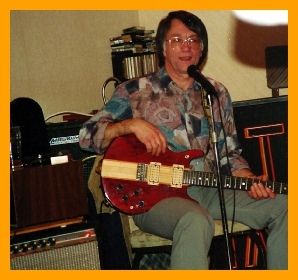 My name is Len Ford and I was lead guitar in a group The Hi-Fi’s and backed Gene on this trip aboard the MV Royal Daffodil from London to Calais, where we joined up with Sounds Incorporated. The man sitting left in the picture with his hand on his chin and dark glasses on was our pianist Brian Bennett. I was standing just next to him behind John-St-John, lead guitarist in Sounds Inc. I remember this day, June 12th 1961. I was 15 years old, living in Calais, and I took this photo after climbing a friend’s shoulders. It was a revelation for me and I began to learn guitar playing. 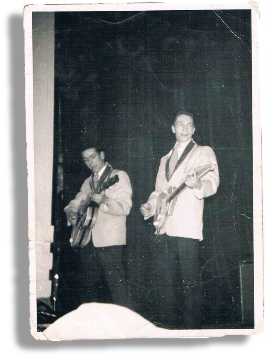 A few years later I played bass guitar in a local group named The Coasters (we ignored there already was a group existing with that name) and we played in Boulogne-sur-Mer at the opening of a Gene Vincent’s concert (it was his last tour in France and he was backed by the Sunlights). We were, as teenagers, very influenced by the music coming from London and Radio Caroline. After a few years I moved to Paris and became photographer and illustrator for magazines and later news graphics designer for TV channels. I always play bass guitar from time to time with friends but not as a professional. I'm happy to hear from you! Are you still playing Rock-n-Roll?